Well there's no chance of boredom here. 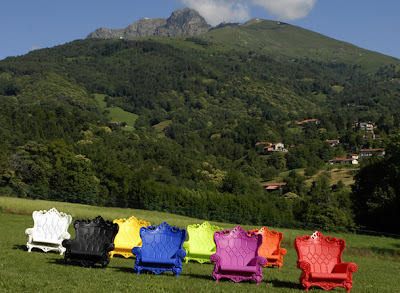 This is a series of outdoor polystyrene chairs called The Queen of Love. They were designed by Graziano Moro and Renato Pigatti for SAW. They are designed in Biella, made in Bergamo and so far as I can tell, unavailable outside of Europe. Pardon the bad pun but who's ready to go for Baroque this summer? 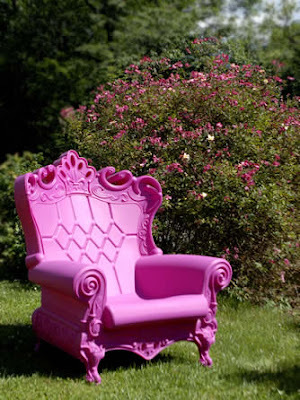 I love the concept and colors (I am a baroque girl at heart) however wonder about sticking to the chairs on a hot summer day. However on a more personal note, I have been meaning to thank you Paul for your dedication to this blog. For the energy and passion that flows from you every single day. I am awed by your ability to create a forum for discussion, to encourage and motivate participation. Complimenti! these are truly fabulous! I work in home & garden, have all my life, and never have I seen anything like them! wonderful...adding to wish list. Gotta get one of those - let's fill a container! JoAnn: Thank you, coming from you that's high praise indeed. Sabrina, Adrienne and Anne: thanks for weighing in. Those would make my HOA have a fit - I shall order four. Raina I can think of no better reason to have them. Anything that gives HOAs fits is a thing worth having in multiples. Are they plastic? I can't condone plastic, no matter how colorful. They are made from recyclable polyethylene.